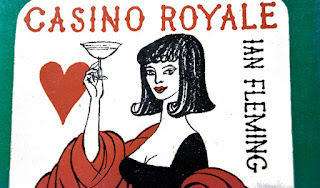 I am currently re-reading the Fleming novels and have so far read CASINO ROYALE and LIVE AND LET DIE and I am now reading MOONRAKER. 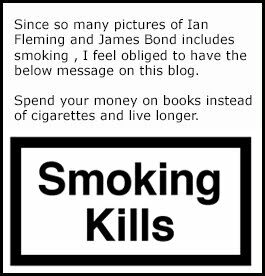 But I believe that they way I am reading the books is a bit different from other James Bond collectors. Early copies from the UK hardback editions is hard to come by and cost a fortune. Many collectors by them and put them in boxes and maybe look at them from time to time. I am actually reading the oldest Cape editions I have in my collection. The MOONRAKER hardback I am reading right now is a 1955 second impression. So why am I not reading a modern paperback. 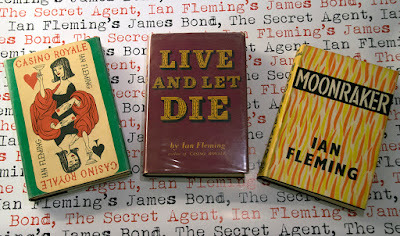 Well first of all I wish to be certain that the text in the novels are like Ian Fleming wrote them. I am not sure if this goes for his books but other authors sometimes gets modernised by the estate to make the story more readable for a younger audience. Another reason for reading the older prints is that they are as close to the 50´s and 60´s that I will ever come and it is something special about going to bed with an early edition of MOONRAKER. You are holding in a book released before the big James Bond bonanza ever took place. It feels genuine in some way. Like going back in time. Like the difference between watching Dr. No on your TV or at the cinema. What printing of the James Bond books do you read? Do you dare to read any of your high valued books or are they put away safely. Please comment below. I would love to hear it.